Different microbial structures and types of microbial cells have different level of resistance to antimicrobial agents. Endospores are considered the most resistant structure of microbes. They are resistant to most agents that would normally kill the vegetative cells they formed from. Mycobacterial infections are notoriously difficult to treat. Protozoa cysts are quite hard to eliminate too. 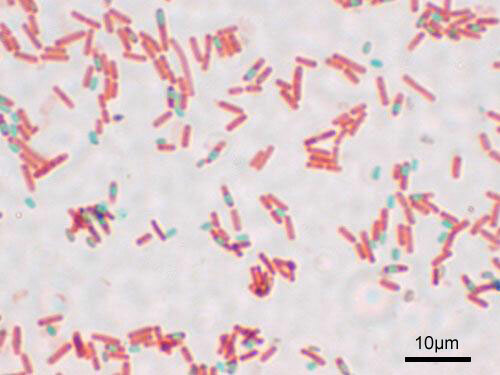 Gram negative species have high levels of natural antibiotic resistance. Staphylococcus aureus is one of the major resistant human pathogens. Fungal cells as well as spores are more susceptible to treatments. Vegetative bacterial and yeasts cells are some of the easiest to eliminate with different treatment methods. Viruses, especially enveloped ones, are relatively easy to treat successfully with chemicals due to the presence of lipids. horizontal gene transfer: The transfer of genetic material from one organism to another one that is not its offspring; especially common among bacteria. endospores: An endospore is a dormant, tough, and non-reproductive structure produced by certain bacteria from the Firmicute phylum. Different microbial structures and types of microbial cells have different level of resistance to antimicrobial agents used to eliminate them. Endospores are considered the most resistant structure of microbes. They are resistant to most agents that would normally kill the vegetative cells from which they formed. Nearly all household cleaning products, alcohols, quaternary ammonium compounds and detergents have little effect. However, alkylating agents (e.g. ethylene oxide), and 10% bleach are effective against endospores. Endospores are able to survive boiling at 100°C for hours. Prolonged exposure to ionizing radiation, such as x-rays and gamma rays, will also kill most endospores. Bacillus subtilis stained with the Schaeffer-Fulton stain. : A stained preparation of Bacillus subtilis showing endospores as green and the vegetative cell as red. Certain bacterial species are more resistant to treatment than others. Mycobacterial infections are notoriously difficult to treat. The organisms are hardy due to their cell wall, which is neither truly Gram negative nor positive. In addition, they are naturally resistant to a number of antibiotics that disrupt cell-wall biosynthesis, such as penicillin. Due to their unique cell wall, they can survive long exposure to acids, alkalis, detergents, oxidative bursts, lysis by complement, and many antibiotics. Most mycobacteria are susceptible to the antibiotics clarithromycin and rifamycin, but antibiotic-resistant strains have emerged. Protozoa cysts are quite hard to eliminate too. As cysts, protozoa can survive harsh conditions, such as exposure to extreme temperatures or harmful chemicals, or long periods without access to nutrients, water, or oxygen for a period of time. Being a cyst enables parasitic species to survive outside of a host, and allows their transmission from one host to another. Protozoa cells are also hardy to eliminate. Gram-negative bacteria have high natural resistance to some antibiotics. Examples include Pseudomonas spp. which are naturally resistant to penicillin and the majority of related beta-lactam antibiotics. This ability to thrive in harsh conditions is a result of their hardy cell wall that contains porins. Their resistance to most antibiotics is attributed to efflux pumps, which pump out some antibiotics before the antibiotics are able to act. Staphylococcus aureus is one of the major resistant pathogens. Found on the mucous membranes and the human skin of around a third of the population, it is extremely adaptable to antibiotic pressure. It was one of the earlier bacteria in which penicillin resistance was found—in 1947, just four years after the drug started being mass-produced. Methicillin-resistant Staphylococcus aureus (MRSA) was first detected in Britain in 1961, and is now “quite common” in hospitals. A recent study demonstrated that the extent of horizontal gene transfer among Staphylococcus is much greater than previously expected—and encompasses genes with functions beyond antibiotic resistance and virulence, and beyond genes residing within the mobile genetic elements. Fungal cells as well as spores are more susceptible to treatments. Vegetative bacterial and yeasts cells are some of the easiest to eliminate with numerous agents and methods. Viruses, especially enveloped ones, are relatively easy to treat successfully with chemicals due to the presence of lipids.